This is the season for lilly pillies (syzygium and acmena) to flower and fruit. And if you want a lilly pilly in your own garden, it’s easy: just find a local bush that has fruit you like the taste of. The outer flesh of the fruit prevents germination, so eat that off. Then plant the seeds in some seed-raising mix. Wait and watch them grow! We’ve found them to strike very easily and to grow vigorously. Once they get bigger, divide them into individual pots. Then transplant them into the garden when they’re ready. This entry was posted in Edible forest gardens, Guerrilla gardening, Native gardens and tagged acmena, edible forest garden, forraging, lilly pilly, syzygium. Whether you’re in the city or the country, you have to wage a constant war on weeds. Many are hard to kill, some are poisonous. Others, however, are hard to identify. And if you don’t know what it is, how do you know whether to pull it out (and how)? When down at the recent Small Farm Field Day, I visited the stand manned by the Department of Agriculture. They pointed me to an excellent phone app, called NSW WeedWise. This contains a comprehensive collection of weeds, including photos and descriptions. It also indicates how serious a weed is, and whether you’re required to destroy it. A lot of the weeds I already knew about, but I was pleased to learn about Moth vine. This looks quite like choko, and it’s growing on the back fence of the convent. Far from being edible, however, it has sap that’s poisonous, and it spreads itself liberally when the seed pod bursts open. Another day, another weed. Download the app from the Apple Store or Google Play. One of the many weeds listed in the NSW WeedWise app. This entry was posted in Edible forest gardens, Guerrilla gardening, Local issues, Useful resources and tagged choko, weeds. Back in 2014, I started planting alongside the pedestrian pathway that runs from Lewisham Station through to West St. There have been ups and downs, but I’m now up to 30 metres of garden, with a mix of small trees, bushes and ground covers (all natives). And then I paused, as I’d been reported to the council for planting trees (shock horror!). 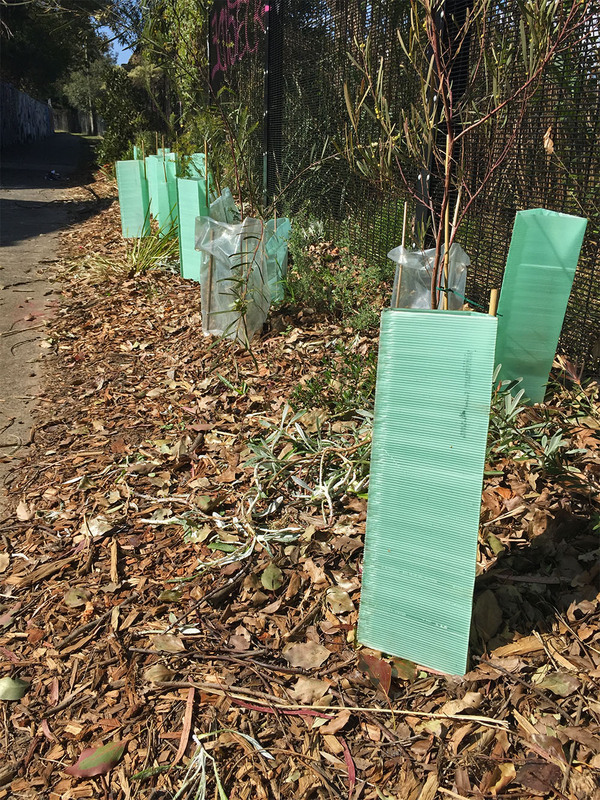 I ended up having a visit from the tree officer at Inner West Council, who turned out to be delightful. Not only did he approve of the work (his first question was: “are you going to do the rest?”), but he offered some free trees. 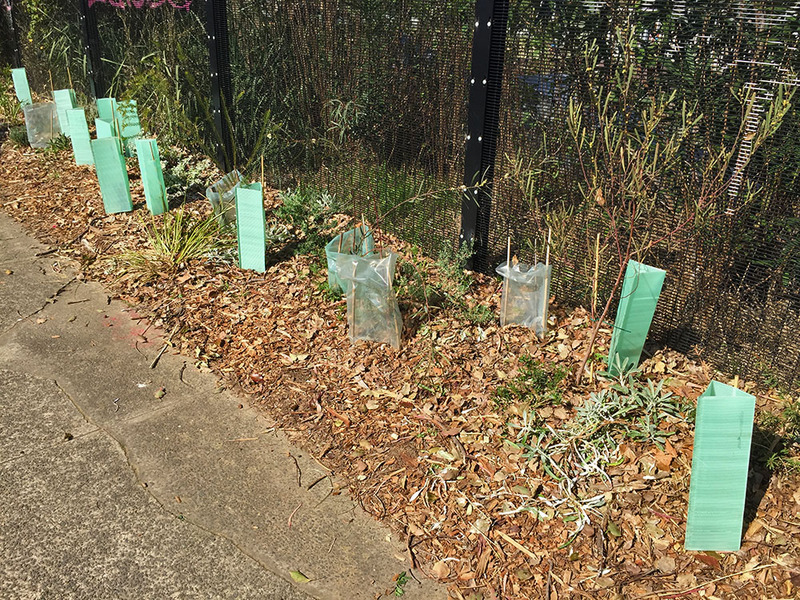 A month or so later, the council planted eight Lilly Pillies, plus a variety of other trees. This has doubled the length of the garden, to approximately 60 metres. Which is about half of the entire length of the passageway. Now we’re getting there! I offered to mulch under the council trees, so I collected free cardboard boxes from the recycling bins at Pig and Pastry, plus free mulch from the Council. Two full ute loads of mulch later, I’m only half way. Phew! Still it’s good exercise, and there’s a palpable sense of progress now. I’ll be at this for a few years yet, so say hi if you see me working away. And any volunteer help would be gratefully received! This entry was posted in Guerrilla gardening, Local issues, Saving the environment and tagged guerilla gardening. Will we get macadamias this year? Our 4 year old macadamia tree, still small at 3m high. The one request from the nuns when I started the guerrilla gardening of the convent land was to plant a macadamia tree. Apparently at a convent they stayed at in the country they had a wide range of fruit trees, and fresh macadamias were a particular delight. The tree I planted 4 years ago is still small, perhaps 3m high. It’s had a rough time, with kids splitting the trunk early in its growth, plus various periods of drought conditions. The fruiting spikes, hanging within the canopy of the tree. Nonetheless, this year has produced a good number of fruiting spikes this year. So hopefully this year will be our first macadamia harvest! This entry was posted in Growing our own food, Guerrilla gardening and tagged convent, convent garden, Guerrilla gardening, macadamia. On the back of our verge gardening, a neighbour from down the street asked if it would be reasonable to plant an olive tree next to their house. Of course I said: go for it! A guerrilla-gardened olive tree in the verge. So we took a small ladder around, and harvested about half a bucket’s worth. Not a huge amount, but still quite a few. Now olives can’t be eaten fresh, as they contain a very bitter substance that needs to be treated away. A bit of Googling found an excellent resources from the University of California titled Olives: Safe Methods for Home Pickling. It outlines seven different methods, and I chose the kalamata-style approach. This involves soaking/fermenting the olives in water for 20 days, changing the water each day. Now I don’t actually like olives, but I’m assured that the results were excellent (a ‘very mild’ flavour, and ‘the best olives I’ve had’). Now I can’t confirm the veracity of these statements, but it was a fun process, and actually not very labour intensive. This entry was posted in Growing our own food, Guerrilla gardening, Making our own and tagged fermenting, Guerrilla gardening, olives, pickling, preserving, vineger. The key to guerrilla gardening is to be indifferent to the survival of any one plant, while remaining passionate about the success of the garden as a whole. In the year since I last blogged about our guerrilla gardening along the railway line, there has been plenty of progress, and a fair share of setbacks. Pretty much all of the groundcovers were wiped out by the big hailstorm. Local kids keep stealing the stakes used to hold the plant guards. Plants are randomly damaged, by dogs or passing people. Some plants simply don’t survive the harsh conditions. The garden has been progressively extended, and it’s now 10+ metres in length. The more established plants are now growing strongly, including all the acacias and callistomons. I’ve grown most of the plants from cuttings, so the cost has been minimal. Surprisingly few plants have been stolen. The key is to keep planting each weekend, to replace the 2-3 plants that are damaged, and to then get slightly ahead. Over a year, this makes a big difference, and the pace should progressively increase. Many of the more established plants are 0.5m high, going into a fresh growing season. I’ve had plenty of great comments from the locals, and it’s an enjoyable challenge. While it’s still early days, I think I’ve proved that one person can have an impact. This entry was posted in Guerrilla gardening, Local issues and tagged acacia, Guerrilla gardening, native gardens, native plants, railway. Our bedraggled first attempt at a straw bale garden. When I came across the idea of straw bale gardens, it seemed like the perfect way of getting greater productivity out of the guerrilla-gardened food forest out the back. As can be seen in the photo above, the garden didn’t work out well in practice. There were two main reasons: the hailstorm, which wiped out most plants; and the local birds who ate the rest. I had a second attempt by planting a new round of seedlings, but we were then deep into winter. So I decided to call it quits — but this is where straw bale gardens deliver their second benefit — by providing free mulch to spread around the garden. Composting down straw, spread around the fruit trees. It was easy to break off ‘cakes’ of the straw, and to layer them around the fruit trees. Fifteen minutes of work, and it was all done. The hay now spread evenly across the whole garden, thanks to the chickens! Of course, the chickens thought this was great! So within a day, they’d re-spread the hay so it was evenly covering everything. With a bit of rain, this is all breaking down nicely. This entry was posted in Growing our own food, Guerrilla gardening and tagged food forest, Guerrilla gardening, straw, straw bales. Our first citrus patch: going to plan, or to ruin? We have plenty of beeswax!